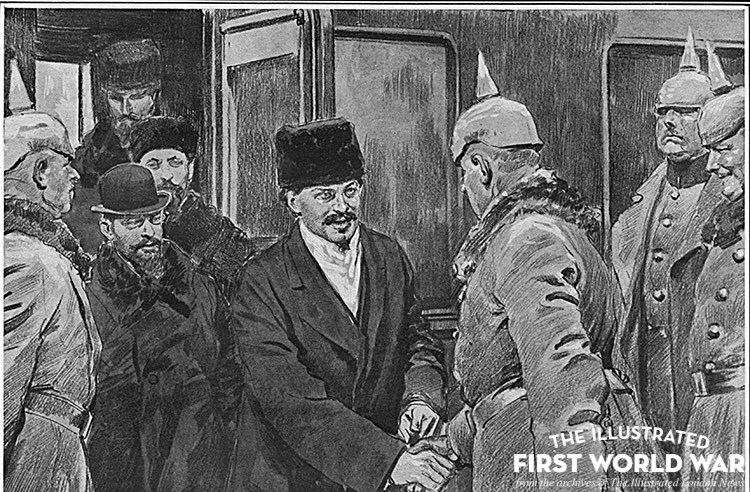 The Treaty of Brest-Litovsk was signed by the new Bolshevik government in Russia in March 1918 and signified the end of Russia’s participation in the First World War. By the beginning of 1917 the Tsar was an unpopular figure among many of his subjects. There had already been a revolution in 1905, caused by the dissolution of the Duma (Russia’s Parliament), though it was ultimately crushed, spreading dissatisfaction amongst Russian citizens. Ultimately, it was the First World War that destroyed the Tsar’s regime. Not only did it illustrate that Russia was no longer a military match for her western European counterparts, it had also hopelessly disrupted the economy. The ‘”February Revolution” ensued in 1917. The Illustrated London News reported that riots and looting had broken out in Petrograd (S. Petersburg) as a result of the scarcity of food. Mutiny became rife within the Russian army. The Duma and Petrograd Soviet (the Petrograd worker’s city council) gathered together to secure order and form a new state. By 2 March 1917 stability had mostly been regained and the Tsar was forced to abdicate his throne. The Provisional Government, left in charge, was committed to keeping Russia in the war. The country had suffered severe military losses and many of the same problems that had existed under the Tsar continued to exist under Alexander Kerensky, leader of the Provisional Government. Meanwhile the Bolsheviks, a group of Marxist idealists, were becoming increasingly popular as the only group who had continually opposed the war. As Russia became increasingly unstable through 1917, Vladimir Lenin, leader of the Bolsheviks, decided to seize control. On 7 November 1917, armed Bolsheviks took control of Petrograd. The Winter Palace, the Provisional Government’s seat of government, was stormed and their delegates were arrested. By mid-November Moscow had also fallen to the Bolsheviks. The ILN showed scenes of the “struggle in Petrograd between the adherents of Lenin and the forces of Kerensky”, noting that Lenin’s forces had been triumphant and had already sent a proposal for an armistice to Germany. The ILN also reported that the Allied governments refused to recognise the new Bolshevik government, not least because they intended to make peace with the Germans. Formal negotiations between Germany and Russia began on 2 December 1917 and the Treaty of Brest-Litovsk was signed on 3 March 1918, enforcing stringent demands upon Russia. Russia lost most of her coal fields and her industrial heartland and made extensive concessions of foodstuffs. The Ukraine became independent as did Finland, Estonia, Lithuania and Poland. The ILN referred to the treaty as a “scrap of paper”, but it was an absolute triumph for the Central Powers. However, the treaty soon became meaningless when Germany and her allies surrendered in November 1918. In Russia, withdrawal from the war allowed the Bolsheviks to consolidate their power. They executed the Tsar and his family, so that the Royalists could no longer challenge them, and smashed the forces that opposed them during the Russian Civil War. A communist regime was established, and was to last until 1991. Brest-Litovsk: Prominent Delegates; and a "Scrap of Paper"
Not Recognised by Any of the Allied Governments: Lenin, "Prime Minister" under the Bolshevist Regime (Right), and Trotsky, the Bolshevist "Foreign Minister"